"IFOR" redirects here. For other uses, see IFOR (disambiguation). NATO was responsible to the United Nations (UN) for carrying out the Dayton Peace Accords. The Dayton Peace Accords were started on 22 November 1995 by the presidents of Bosnia, Croatia, and Serbia, on behalf of Serbia and the Bosnian Serb Republic. The actual signing happened in Paris on 14 December 1995. The peace accords contained a General Framework Agreement and eleven supporting annexes with maps. The accords had three major goals: ending of hostilities, authorization of military and civilian program going into effect, and the establishment of a central Bosnian government while excluding individuals that serve sentences or under indictment by the International War Crimes Tribunals from taking part in the running of the government. IFOR's specific role was to implement the military Annexes of The General Framework Agreement for Peace (GFAP) in Bosnia and Herzegovina. IFOR relieved the UN peacekeeping force UNPROFOR, which had originally arrived in 1992, and the transfer of authority was discussed in Security Council Resolution 1031. Almost 60,000 NATO soldiers in addition to forces from non-NATO nations were deployed to Bosnia. Operation Decisive Endeavor (SACEUR OPLAN 40105), beginning 6 December 1995, was a subcomponent of Joint Endeavor. The Dayton Agreement resulted from a long series of events. Notably, the failures of EU-led peace plans, the August 1995 Croat Operation Storm and expelling 200.000 Serb civilians, the Bosnian Serb war crimes, in particular the Srebrenica massacre, and the seizure of UNPROFOR peace-keepers as human shields against NATO's Operation Deliberate Force. Admiral Leighton W. Smith, Jr. (Commander in Chief Allied Forces Southern Europe (CINCSOUTH)) acted as the Joint Force Commander for the operation (also known as Commander IFOR (COMIFOR)). He commanded the operation from HQs in Zagreb and later from March 1996 from the Residency in Sarajevo. Lt Gen Michael Walker, Commander Allied Rapid Reaction Corps (ARRC) acted as the Land Component Commander for the Operation, commanding from HQ ARRC (Forward) based initially in Kiseljak and from late January 1996 from HQ ARRC (Main) Ilidža. This was NATO's first ever out-of-area land deployment. The Land Component's part of the operation was known as Operation Firm Endeavour. At its height, IFOR involved troops from 32 countries and numbered some 54,000 soldiers in-country (BiH) and around 80,000 involved soldiers in total (with support and reserve troops stationed in Croatia, Hungary, Germany, and Italy and also on ships in the Adriatic Sea). In the initial phases of the operation, much of the initial composition of IFOR consisted of units which had been part of UNPROFOR but remained in place and simply replaced their United Nations insignia with IFOR insignia. Multi-National Division (South-East), Mostar - French led. Also known as the 'Division salamandre.' MND-SE included two French brigades, one Spanish brigade, one Italian brigade, a Portuguese Parachute Battalion of 700 plus a services and support detachement of 200, and Egyptian, Jordanian and Ukrainian units (around 2,500 men), as well as a Moroccan task force. The divisional headquarters was provided in rotation by divisions including the 7th Armoured Division and the 6th Light Armored Division. Multi-National Division (South-West), Banja Luka – British led. The British codename for their armed forces' involvement in IFOR was Operation Resolute. MND-SW included a British brigade, a Canadian Brigade (Canadian code name Operation Alliance) and Dutch units. Division headquarters was provided by 3 (UK) Division then 1st (UK) Armoured Division. Multi-National Division (North), Tuzla – American led. Task Force Eagle. The US Army 1st Armored Division under the command of Major General William L. Nash, constituted the bulk of the ground forces for Task Force Eagle. They began to deploy on 18 December 1995. MND-N was composed of two U.S. Brigades, a Russian brigade, a Turkish brigade, and the Nordic-Polish Brigade. The 1st Brigade of 1st Armored Division was commanded by Colonel Gregory Fontenot and covered the northwest. The 2nd Brigade of 1st Armored Division, led by Col John Batiste, constituted the southern flank of the US sector, based in Camp Lisa, about 20 km east of Kladanj. Task Force 2–68 Armor, based in Baumholder, Germany (later re-flagged to 1–35 AR), was based in Camp Linda, outside of Olovo. This was the Southern boundary of the US Sector. The 1AD returned in late 1996 to Germany. One of MND-N's components was the Nordic-Polish Brigade (NORDPOLBDE) (Polish: Brygada Nordycko-Polska) which was a multinational brigade of Denmark, Estonia, Finland, Latvia, Lithuania, Norway, Poland, Sweden and USA. It was formed in 1996, and till its disestablishment in 2000 it was stationed in Bosnia and Herzegovina as part of both IFOR and SFOR. The Nordic Support Group at Pécs in Hungary handled the relay of supply, personnel and other logistical tasks between the NORDPOL participating countries and their deployed forces in Bosnia-Herzegovina. It comprised several National Support Elements. On 20 December 1996, the task of IFOR was taken over by SFOR. In turn, SFOR was replaced by the European EUFOR Althea force in 2004. NATO began to create service medals once it began to support peacekeeping in the former Yugoslavia, which led to the award to IFOR troops of the NATO Medal. ^ "British Forces Bosnia". Hansard. 18 July 1996. Retrieved 13 April 2013. ^ "Army senior appointments". United Kingdom Government News. 23 July 2002. Archived from the original on 26 July 2011. Retrieved 13 April 2013. ^ An account of the interactions of the Americans and Russians in Bosnia in 1996 may be found in James Nelson, Bosnia Journal: An American Civilian's Account of His Service With the 1st Armored Division and the Russian brigade in Bosnia. ^ "History of the NATO-led Stabilisation Force (SFOR) in Bosnia and Herzegovina". NATO. Retrieved December 18, 2018. ^ Hawton, Nick (October 23, 2004). "EU troops prepare for Bosnia swap". BBC News. Retrieved December 18, 2018. ^ "NATO Medal for Former Yugoslavia (NATO-FY)". National Defence and the Canadian Armed Forces. July 22, 2015. Retrieved December 18, 2018. Lord, Cliff (2004). Royal Corps of Signals: Unit Histories of the Corps (1920–2001) and its Antecedents. Helion & Company. ISBN 978-1-874622-92-5. Phillips, R. Cody. Bosnia-Herzegovinia: The U.S. Army's Role in Peace Enforcement Operations 1995–2004. Washington, D.C.: United States Army Center of Military History. CMH Pub 70-97-1. Archived from the original on 9 December 2013. Lambert, Nicholas (2002). Measuring the Success of the North Atlantic Treaty Organisation (NATO) Operation in Bosnia and Herzegovina 1995 – 2000. Issue 140/2, pp. 459–481. European Journal of Operations Research, Special 2000 Edition. Dutchbat was a Dutch battalion under the command of the United Nations in operation United Nations Protection Force (UNPROFOR). It was hastily formed out of the emerging Air Mobile Brigade of the Royal Netherlands Armed Forces between February 1994 and November 1995 to participate in peacekeeping operations in the former Yugoslavia. It was tasked to execute United Nations Security Council Resolution 819 in the Bosniak Muslim enclaves and the designated UN "safe zone" of Srebrenica during the Bosnian War. United Nations Security Council resolution 1247, adopted unanimously on 18 June 1999, after recalling resolutions 1031 (1995), 1035 (1995), 1088 (1996), 1103 (1997), 1107 (1997), 1144 (1997), 1168 (1998), 1174 (1998) and 1184 (1998), the Council extended the mandate of the United Nations Mission in Bosnia and Herzegovina (UNMIBH) for a period terminating on 21 June 2000 and authorised states participating in the NATO led Stabilisation Force (SFOR) to continue to do so for a further twelve months. United Nations Security Council resolution 1357, adopted unanimously on 21 June 2001, after recalling resolutions 1031 (1995), 1035 (1995), 1088 (1996), 1103 (1997), 1107 (1997), 1144 (1997), 1168 (1998), 1174 (1998), 1184 (1998), 1247 (1999) and 1305 (2000), the Council extended the mandate of the United Nations Mission in Bosnia and Herzegovina (UNMIBH) for a period until 21 June 2002 and authorised states participating in the NATO-led Stabilisation Force (SFOR) to continue to do so for a further twelve months. 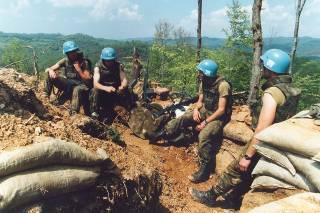 The Battle of Vrbanja Bridge was an armed confrontation which occurred on 27 May 1995 between United Nations (UN) peacekeepers from the French Army and elements of the Bosnian Serb Army of Republika Srpska (VRS). It began after the VRS seized French-manned United Nations Protection Force (UNPROFOR) observation posts on both ends of the Vrbanja Bridge crossing of the Miljacka river in Sarajevo, Bosnia and Herzegovina during the Bosnian War. Upon seizing the bridge, the VRS took the French peacekeepers hostage.